It was an amazing conference - thank you to all of you who attended! Interested in hearing workshops again or listening to workshops you missed? Click the buy button below to purchase conference recordings. When you click on the buy button above you will be directed to a page that requires a password. The password can be found on page 5 of your conference program or by calling the Ticket Office at 651-631-5151. 2019 Featured Workshop Speakers are Kevin & Susie Larson and Nina Barnes. 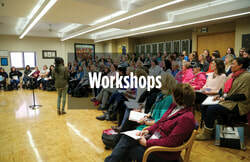 2019 Workshop information is now available. Learn more about our 2019 partners University of Northwestern, 98.5 KTIS and Faith Radio Network. We value your input. Please complete the 2019 conference survey. Answer your most frequently asked questions about the Set Apart Conference including what to bring, can I bring my baby, what my registration includes, and more.